James William Flintoft (most often called Bill) never set out to be Mayor. In fact, he didn’t seem to harbor any political aspirations. According to his son Tom Flintoft, Flintoft likely got involved in local politics because something happened that annoyed him. Nevertheless, Bill Flintoft served as Mayor for twelve years, the longest running mayor in the history of Issaquah up until Mayor Ava Frisinger’s anniversary as mayor in 2010. During the course of his term in office, the population tripled. Along with the growth came an enormous amount of change. Flintoft managed to navigate the challenges that this kind of rapid growth brings. Bill Flintoft was born on June 21, 1908 to James and Lena Flintoft. At that time, his parents were living in Canada. However, Flintoft was born in Illinois. Accord-ing to Tom Flintoft, Lena Flintoft insisted that they go to the United States to have their child, so that when he reached 21 he could choose his citizenship. Flintoft spent his early life in Ontario; after completing high school, he served in the Merchant Marines for several years. He later attended mortuary school in Cincinnati, Ohio. In 1934, Flintoft moved to Washington state. He worked for Clark, Rafferty and Putnam, a funeral home in Seattle, for several years. While living in Seattle, he met Alberta Zulauf. They married in 1935. Within a few years, the Flintofts de-cided to relocate to a smaller town. They considered Edmonds and Enumclaw, but ultimately selected Issaquah. At that time, Issaquah’s long-time coroner and undertaker, named Fisher, was selling his business. Fisher made a handshake deal with Bill Flintoft, agreeing to sell the business to him. The Flintofts had already made all the arrangements for their move when they found that Fisher had sold to a Seattle funeral home instead. Undeterred, they decided to stay in Issaquah and take their chances running a second funeral home. Alberta Flintoft chose the site of Flintoft’s Funeral Home. She noticed a graceful house on Mill Street (today’s Sunset Way) where the Hobbs family lived, knocked on the door, and asked if the oc-cupants wished to sell. Although Harriet Hobbs hadn’t really thought about selling until asked, her husband had died just a few years before and her sons were now grown. She sold to the Flintofts, who opened their business on April 12, 1938. The population of Issaquah at that time was 800 people. The rapid growth made possible by Highway 10 and the floating bridge would not begin for a few more years. Issaquah was known for being tightly-knit, but the Flintofts quickly made themselves part of the community’s fabric. Flintoft served as Master of Issaquah’s Myrtle Lodge in 1943, and also participated in the local Masonic lodge. As early as 1941, he served as Deputy Coroner for King County, which probably inspired confidence in him among Issaquah’s residents. As the “community mortician” (as stated in one of the newspaper ads he ran), he also developed relationships with community members during times of personal loss and vulnerability. 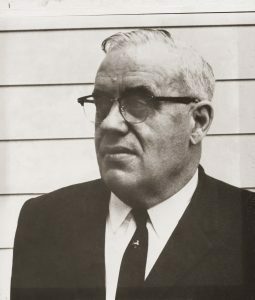 Although Flintoft and his family were active in the community, it was not until 1951 that Flintoft got involved in politics. He attended two Council meetings in spring of 1951. At the first, he persuaded the City to purchase pipe to be laid up to the cemetery, to provide water and a means of irrigation. At the second, he requested that the Council do something about the cows that wandered into the cemetery, treading on graves. At the spring political caucus, Flintoft was selected as a candidate for the City Council. He was sworn into office as council member on June 4 of 1951. 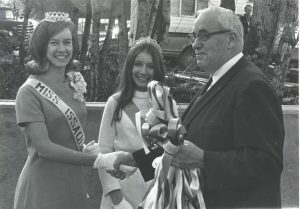 Miss Issaquah Sharon Weiss, at left, Issaquah Homecoming Queen Laura Shunk, in middle, and Mayor Bill Flintoft, at the the ceremonies for the dedication of the Park Boulevard Bridge, 1970.
ings in spring of 1951. At the spring politi-cal caucus, Flintoft was selected as a candidate for the City Council. He was elected, and was sworn into office June 4, 1951. Flintoft served as a councilman for seven years. On July 17, 1958, Mayor Alting R. “Buck” Lee resigned from his post. The Council accepted his resignation with regret. As most senior council member, Flintoft was designated Mayor Pro-Tem. The following week, he was officially elected by the other council members to serve the remainder of Lee’s unexpired term. Flintoft was re-elected to three more mayoral terms. Up until the tenure of Ava Frisinger, he was the longest-serving mayor of Issaquah. Issaquah’s population was just under 2,000 when Flintoft became mayor — twice what it had been when the floating bridge opened in 1940. It would double again be-fore Flintoft’s term ended. Along with the growth came an enormous amount of change. Flintoft managed to navigate the challenges this kind of rapid growth brings. Skip Rowley, recalling the city’s primary challenge, remembers, “the city had no services to offer.” Issaquah lacked an adequate water supply and a sewer system, for starters. The secondary challenge was that Flintoft worked for a community that did not, by and large, welcome change. According to his son, Tom, Flintoft’s perspective was that growth was inevitable. The city could either control the growth or let growth control the city. If appropriate planning took place, the community could benefit from growth. Flintoft’s common sense approach was to find a compromise between the pro-growth faction and the no-growth faction. In 1969 Flintoft chose not to seek another term in office. That fall, Keith Hansen narrowly beat Rod Anderson in the mayoral election. He continued the work of building the city’s infrastructure. Flintoft died on December 14, 1971, at only 63 years of age. His memorial was held at Flintoft’s Funeral Home, the business he operated for nearly 35 years, and he was interred at Hillside Cemetery. The business he built continues to operate under the management of his son and grandson.